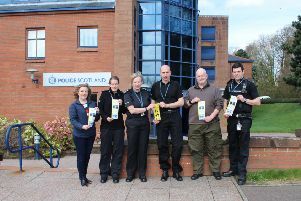 Police Scotland are asking people to be sensible around alcohol if they are out socialising in Stranraer over the Christmas and New Year period, as officers plan more patrols to support the ‘Pubwatch’ scheme run by the license holders in the town. Constable Ronnie Boyce said: “As the local Community Police Officer with responsibility for Stranraer Town Centre, I thought I would take this opportunity, with the festive period approaching, it’s worth noting that there tends to be an increase in the amount of people out socialising in licensed premises and enjoying their Christmas nights out. “Alcohol affects other aspects of our community safety as well. Far too often the Christmas period also sees people drinking to excess, and leaving themselves vulnerable to criminals in terms of their personal safety and their property, such as mobile phones, purses wallets and handbags. Throughout the festive period you will also see an increase in our officers checking in on licensed premises, to reassure people, deter crime and promote responsible behaviour. In terms of the people we see ending up in custody, on many occasions the problems that they encounter can be the result of drinking too much alcohol at home, before heading out on the town. “Where alcohol is involved, tempers can be lost very easily and people end up getting involved in things, and doing things they would never do when they were sober. “Many an enjoyable evening has led to someone having had far too much to drink, letting themselves down, and ending up in an uncomfortable police cell and with a court appearance. Where people do commit assaults at licensed premises they can expect to be referred to the local Pubwatch Scheme where local licensees will decide whether they should be banned from all licensed premises, to ensure that those who want to enjoy their local pubs can do so safely. Reducing violence in the vicinity of licensed premises is a priority area for the police, so please enjoy yourselves but do so in moderation. “Stranraer Pubwatch scheme currently has 29 members from licensed premises in Stranraer and the Rhins. The aim of the scheme is to promote a safe and secure environment in all licensed premises. To do this scheme members work together to reduce anti-social behaviour, and prevent violence at licensed premises, ensuring a better safer social environment for their patrons and the wider public. That can include voting to exclude or ban individuals whose behaviour has meant their presence in Licensed Premises is no longer welcome. “To do that the scheme works closely with the police and local statutory agencies and organisations to enable them to manage anti-social/offending behaviour more effectively, through sharing information and taking decisions as a group. “Stranraer Pubwatch is run by local licensed premises, not the police. I assist and support the group, but any decisions are made by the members, not by the police. You may have seen the scheme logo below, displayed within licensed premises. Q. How can a person be banned on Pubwatch if they haven’t been convicted of a criminal offence? A. An exclusion order (ban), is a civil action brought by Pubwatch members, the aim of the scheme is early intervention. A person does not need to be involved in criminality or be convicted of an offence to be referred to Pubwatch members. Q. How can I be banned if the incident did not occur within a licensed premises? A. Stranraer Pubwatch works closely with partners including Police. If a person has exited a licensed premises and become involved in criminality, then the Police will make the scheme members aware of the incident. Q. Who makes the decisions about a person referred to Pubwatch? A. All eligible scheme members have the opportunity to vote on the outcome, the Police do not have a vote. Q. What would happen if I breached my ban? A. Any ban breaches will be discussed when your ban is coming to an end, any recorded ban breaches may significantly increase your initial ban. Q. Can I appeal a ban? A. Yes, a ban can be appealed, it will be referred back to the scheme members for a vote. Constable Boyce continued: “As well as people who commit offences, unfortunately poor decisions and a lack of awareness caused by excess alcohol can also increase the chances of becoming a victim of crime. We would urge people to stay with their friends, look after each other, and keep each other safe. Always plan how you intend to get home safely, and avoid confrontational situations. Keep your wits about you, drink in moderation and be sensible! Our officers will be out in numbers monitoring licensed premises and the night time economy, and will be robust in their approach to those who break the law, trying to ensure that people can enjoy themselves safely.